Want a Better Way to Floss? Do you hate flossing as much as I do? Are you looking for a better way (might I add – more fun way) to improve gum health? A Waterpik is the way to go. ~ Ultra Plus features 10 pressure settings, improved water on/off switch on handle, and a contemporary design with chrome accents, 90-seconds of water capacity. ~ In-lid storage to keep tips clean, 10 press settings for optimum control and customization. 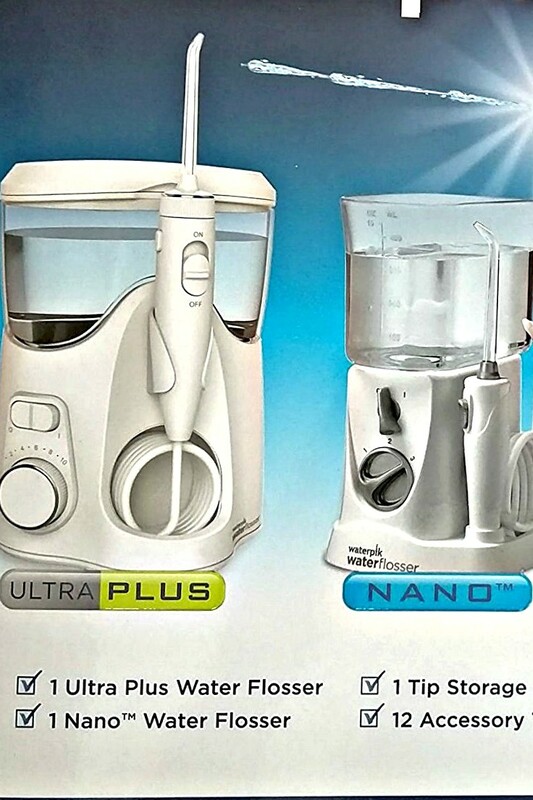 ~ Nano water flosser features: Compact design perfect for travel in North America, energy efficient and quiet operation. ~ Includes: 1 Ultra Plus water flosser – 1 recommended model by dental professionals, 1 Nano water flosser – 50% smaller than full-size models; 12 – Accessory Tips, 1 – Tip Storage Case, 1 – Nano Premium Travel Case. ~ Can be used with your favorite mouthwash ideal for braces and other dental work. The easy and more effective way to floss. The Waterpik Water Flosser is clinically proven to remove up to 99.9% of plaque from treated areas and is up to 50% more effective for improving gum health vs. string floss. It’s safe, gentle and perfect for anyone with implants, braces, crowns, bridges, or periodontal pockets. Simply fill the reservoir with water, point the tip at your gumline and floss. Water flossing is fast, easy and the best way to improve gum health. A unique combination of water pressure and pulsations clean deep between teeth and below the gumline, removing harmful bacteria and debris that traditional brushing, air flossing and string flossing can’t reach. All it takes is one minute a day for a cleaner, fresher and healthier mouth. Ultra Plus features 10 pressure settings, improved water on/off switch on handle, and a contemporary design with chrome accents, 90-seconds of water capacity. Added Bonus Video: how to floss without drenching your bathroom! Pro Tip: To avoid a wet mess, don’t look in the mirror to watch yourself as you use the Waterpik. I think you know how I know this. I tend to get quick plaque buildup behind my two bottom teeth. In a week’s time of using the Waterpik – no plaque buildup. The attachments are fun to experiment with and my teeth feel squeaky clean after using the Waterpik, which keeps me coming back every day since I bought it. Can’t say that about many things that are good for you, right? I don’t know anyone who likes to floss. I bet most people fudge the truth when telling their dentist they do (FYI: they know!). I have found I will use the Waterpik where I won’t floss with string. BONUS: This Waterpik package came with two units: a normal-sized one and a travel unit. I keep the travel unit in my bathroom, while Garry uses the other. Can’t wait to hear the oooos and ahhhhs from my dental team during my next visit. Finally, a better way to floss! Please share this post with a non-flosser! I had a water pic when I had braces and loved it. Now that I’m older and fighting to keep my teeth it might just be time to get another one! I wished I had used it through treatment; I think it would have been extraordinarily helpful. 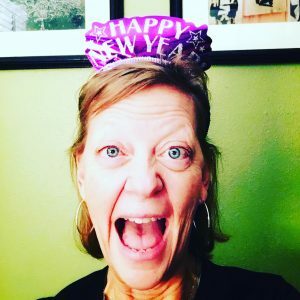 I’m also at the age of fighting to keep my mouth and teeth healthy! If you do purchase one, feel free to use the links on this page 😉 Thank you! Ah, the crown situation – we know this well. It works for those areas as well! Happy to help with your research needs! As I mentioned to Linda, if you do purchase one, feel free to use the links on this page 😉 Thank you!